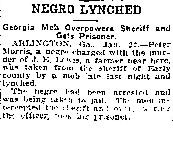 Killed January 21st, 1915, near Arlington, Georgia, in Early County. Morris was arrested, then taken from the sheriff en route to jail and killed nearby. No investigation was made into who was responsible, nor was the sheriff disciplined for losing his prisoner.